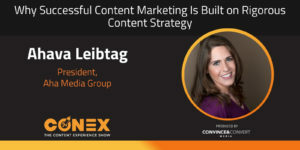 Ahava Leibtag, President of Aha Media Group, joins the Content Experience Show to discuss the intersection of content strategy with content marketing. In a world of endless options and convenience, consumers are looking for experiences. The discovery process, purchase, use of your product is an experience for your customers, and your content strategy has to take that into account. Unfortunately, many businesses get sidetracked when trying to create that amazing experience. It all begins and ends with the content. A great-looking user interface or killer branding are certainly a part of your content strategy, but it is all pointless if they lead your customers to lackluster content. As a content strategist, this means having a firm grasp on the goals and ideals of your business while communicating them effectively to your audience. You are the bridge between your brand and the customer, so being able to translate the promises and values of your business into a format with which your consumers can relate and connect is key. Quality content is the heart of the customer experience. 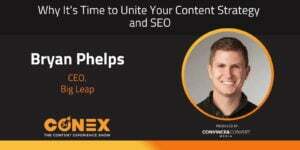 Why content strategy is separate but complementary to content marketing. How Aha Media started the November Writing Challenge. Why you should read your writing out loud. 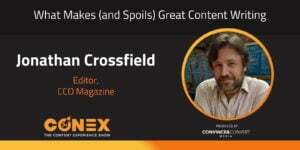 Why content is the most critical component of the user experience. The importance of using “plain language” in your content. What is your favorite guilty pleasure book? Ahava doesn’t believe in guilty pleasures. If you like it and get something out of it, it’s a good book! Ahava’s binge-watching schedule mostly revolves around her kid’s interests. Lately, she’s been watching the Marvel movies with her son and The Great British Baking Show with her daughter! Anna Hrach: Hey, everybody. Welcome to the Content Experience Show Podcast. My name is Anna Hrach, and normally I would be joined by the ever amazing, Randy Frisch. But he is actually not with us today. Instead, it is going to be just you, me, and our amazing guest, Ahava Leibtag. Anna Hrach: Ahava is the president and owner of Aha Media Group, which is a content strategy and content marketing consultancy. 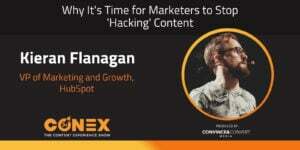 She is also author of The Digital Crown: Winning at Content on the Web, and you've probably seen her at just about every content marketing or content strategy conference you have ever attended, because she is an amazing and sought after speaker. Seriously, if you have a chance to go see her speak in person, please do. She is amazing, and entertaining, and wonderful. Anna Hrach: Her and I got to chat a lot on this episode about some of the nitty gritty of content, which Randy and I sometimes don't get into, and we haven't gotten into with a lot of our other guests. But Ahava, of course having a writing background, we got to get into it a little bit. Fellow word nerds, you are in for a treat. Anna Hrach: Now she has some amazing advice when it comes to content clarity, and writing incredibly effective content. I'm just gonna bring her in and let her tell you all about it. Without further ado, let's go ahead and chat with Ahava. Anna Hrach: Hey, Ahava. It is so fantastic to have you here. I get to talk to you all the time because I'm lucky like that. But I'm really happy that you finally are able to come here and talk to all of our listeners because first, one of the best writers I have ever met, you are one of the best speakers I have ever seen, and I am so excited for you to drop so much gold on our audiences. It's gonna be amazing. I'm so happy you're here. Ahava Leibtag: Wow. Thank you. I really appreciate that. Can you come live with me and whisper in my ear every day? Anna Hrach: Yes. Every time you get on a call, I'll just pop in with that intro, and just leave. Ahava Leibtag: Love it. Anna Hrach: I know you really, really well. But for those who have only ever seen you speak at Content Marketing World, or even Confab, can you give everybody just a little bit of info about your background, Aha Media Group, obviously? Just tell everybody a little bit about yourself. Ahava Leibtag: I want to say first, that I was voracious reader as a kid. I think that books were my best friends. I loved reading and I loved language. That really, I think, has taken me onto this lifelong journey of wanting to be a great writer, and wanting to communicate with audiences. Ahava Leibtag: I went to college and studied English Communications, and then I went and got a graduate degree in Communications. But what I really studied was Critical Theory, which is this interdisciplinary approach to how ideology shapes our ideas about the world. I did my thesis on Save the Last Dance and Dirty Dancing. I looked at how female identity politics had changed over the course of the time that Dirty Dancing came out, versus the time that Save the Last Dance came out. 'Cause it's basically the same story, but the characters, their identities changed, and who they are changes. It take a really good look at female sexuality, and the way that Americans changed their minds about that over time. Ahava Leibtag: Then I worked for the government for a while. Then I didn't do so well in the federal government. Anybody who knows my personality at all knows that that's just not the right cultural fit. I got a really great opportunity to do a freelance writing gig for a friend of mine in a hospital. I started doing that, and I just loved it, and decided to leave the federal government, which everybody thought I was crazy in Washington D.C., where I live in one of the suburbs. No one leaves a federal job. It's your ticket a fabulous retirement, and great health insurance. I was just like, "Nah, I'm gonna go do something crazy and risky," and it's totally paid off. Ahava Leibtag: Aha Media Group has 40 people, content strategists, writers, editors, account managers. I love what I do. I love that I'm a woman-owned business, and that I employ women who want a work-life balance. Everybody works from home. It's a distributed workforce. We do great work for our clients. I'm fiercely, fiercely proud of it. Ahava Leibtag: I'm a mom to three, as you know, wacky and wild kids. Anna Hrach: I do love following all of their adventures on Instagram. Yeah, they're amazing. I love all the updates about your kids and our family. I would absolutely agree that that paid off. Anna Hrach: Also, it takes a very, very specific person, I think, to work in government. I know I wouldn't be able to cut it. I think, especially with your creativity, and you are very ... I mean this in the most amazing way, you're very opinionated. You will stand up and put your stake in the ground. I feel like that might jive so well with government, sometimes. I think you made the right decision. You have a wonderful practice now, Aha Media. Anna Hrach: One of the things that I also love about you, and that we have in common, is that we both live in two separate content worlds. One world would be the content strategy world. The other would be content marketing. Now for those who may blanket call content marketing, content strategy, or refer to their content marketing as content strategy, how do you help people understand the difference between those two worlds? Ahava Leibtag: Sure. I think content strategy is what helps you get at better content marketing. To me, the content strategy, I always thought that that phrase wasn't really right, but the content strategy helps you get at the tactic of content marketing. To me, content marketing is developing a relationship with your audience, and content strategy helps give you the tactics to help get there. Ahava Leibtag: There's a lot of division between the two, and I think it's really silly. We're all trying to do the great thing, which is provide the best customer experience that we can. I think any time you attach the word marketing to something, and anytime you attach the word strategy to something, people see one as more rigorous than the other, which I think is so silly. Ahava Leibtag: I think marketing is gonna morph into customer experience in the next 10 years. I don't think we're necessarily gonna call it marketing. We're probably gonna move and evolve into something else. But for me, the major difference between the two is that content strategy is really composed of three different things. It's editorial brand, workflow, and then what now people are calling content engineering, or I even like better, content ops. 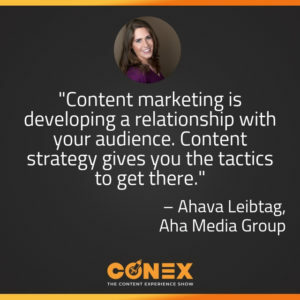 Ahava Leibtag: Content marketing is really about developing a relationship with your audience through all different formats of content. That to me is really the major difference. All the parts of content strategy lead into, if you're trying to create great content marketing. That's how I see the two worlds different, but you can have content strategy without content marketing, but you can't have content marketing without content strategy. Anna Hrach: Right. Yeah, no it's so fascinating, the divide between the two worlds. I think there's this weird dividing line between them, where people on both sides feel like they can't belong in both camps, or that they have to choose. It's fascinating to me. I think people, a lot of times when they hear the word marketing, cringe and feel like it's a little bit too promote-y, but it doesn't have to be that either. Like you said, customer experience. That doesn't have to be shoving a brochure in their face. Ahava Leibtag: Exactly. Exactly. I think that part of it is also is that we're still in the Wild Wild West of the web. What started off as SEO, and search engine optimization, and then that became everybody's a content strategist, and then it became everybody's a content marketer. That was part of what made it interesting for people to feel like, "I'm a rigorous content strategist and that person's just changing their name depending on the trend of the moment." I think it's silly. Ahava Leibtag: I think we all are trying to do great ... I hope we're trying to do great work, and some of us come at it from one part of the discipline, and some of us come at it from the other part of the discipline. But I think when you're in a room, you got to shake off your ego and just say what's best for the customer. Anna Hrach: Totally. I love that you ... Actually, that's really what Aha Media is all about. Especially your promotion of using things like plain language, and being so customer centric, and being so audience centric. I think that's really what strikes at the heart of both disciplines. Anna Hrach: The other thing that I love is that you come out with all these amazing guides to help people do that, for free, for just an email download. One of the ones that I love and reference all the time is that SEO Cheatsheet. Even you originally came up with the guide to web writing. It has all these amazing check boxes, and covers all the grounds. You provide all of these amazing tools for free. I love them. And you just now have the writing November works exercise. Ahava Leibtag: Yeah, the November Writing Challenge. That came from my being frustrated with myself about my own writing. I think that if you want to be a great writer, you have to write every day. Writing is different for everyone. For me, sometimes writing is really just sitting there with a pen and scrawling out what I'm thinking. Sometimes I do my best writing when I walk, so it's walking and just talking into my iPhone, and taking a voice note. Sometimes it's sitting there typing and banging your head against the screen. Ahava Leibtag: It doesn't have to be ... I think one of these things that we have gotten into is this black and white idea about a lot of different practices. Like when you meditate, you have to sit in a room with a gong. That's silly. There's all these different ways to get at it. Sometimes I meditate on a plane as it's taking off. I'm just breathing in and breathing out. For me ... Anna Hrach: I don't know how you do that. I would be hyperventilating, but yes. It's always like, I'm always like, "The most dangerous part is take off and landing." But yeah. Ahava Leibtag: Well, I'm always taking off and landing. Anna Hrach: That's Very true. That's very true. You're always on the road. Ahava Leibtag: Right, exactly. Ahava Leibtag: For me, what happened was I started to think about if somebody would just say to me, "Write about this, write about that," 'cause ideation is really the hardest part of it. I said, "Let's do this thing where we ask the writing community to get together, and write together, and learn about how to do it." Ahava Leibtag: Just today I Insta Storied the first writing prompt, which was to write about your favorite person using five adjectives. It was just really interesting for me to see my own process. First I wrote down all the adjectives about my grandmother, that's who I chose to write about. Then I started typing. Then I went back in, and I highlighted all the adjectives, and then I changed them. It was just really interesting for me to see how I approached it. What I'm hoping is that other people will share how they approach it because I'm sure I can learn a ton from them also. Ahava Leibtag: That was the goal behind that. The goal behind that was to give people a sense of community, and for them to get insight into somebody that hopefully they think knows what she's doing, which is sometimes true and sometimes not true. To learn how to be a better writer. I cannot tell you how many people have emailed me, or texted me and been like, "I'm totally doing this," who are not writers professionally, but who want to get better at communicating. That's really exciting. Anna Hrach: One of the things that I love about that November Writing Challenge too, is the tips on there are solid gold. They are amazing for anybody who's a writer, whether they write every single day, or they want to get back into writing, or even want to start writing from scratch. But I love that it eases you into the process of writing 'cause it is a creative process. Especially the creative side of ourselves, it's just like any other part where you have to exercise it, you have to flex it, you have to keep it moving and going in order to really keep it sharp. I love that, like you said, the first exercise is taking someone you know and writing five adjectives about them. Anna Hrach: The other one that I love, and I do literally with every single thing that I write, is I read it out loud. It makes me feel like such a psycho sometimes, 'cause I'm sitting in a room, talking to myself in this very, not radio announcer voice, but you hear the cadence, and the flow, or you catch a typo that you read over in your brain. The whole 30 days is just peppered with these amazing insights. I love this calendar so much. Ahava Leibtag: Thank you. I really appreciate it. Yeah, you can download it from our website at ahamediagroup.com. It's not gated, so we're not tracking who downloads it. Like I said, I'll be Instagram Storying it, so definitely follow me on Instagram. Ahava Leibtag: I think the other thing to know about it is we really tried to mix creative and technical. There's gonna be SEO research in there, and there's gonna be bulleting in there, and there's gonna be all types of things that are really gonna round you out as a great digital and technical writer. Ahava Leibtag: The reading out loud is critically important. Neuroscience says that reading comprehension is two things, decoding, actually taking the shapes of the letters, recognizing them as making sounds and putting words together. Then the next part is prosody, which is like what you said, tone, intonation, flow. If you don't read your content out loud, while the words may look good, you have no idea how they sound in somebody's head, and therefore you've completely missed their reading comprehension. Yeah, everyone feels like a psycho when they read out loud. Sometimes I'm so crazy I'll read it out loud, and into my iPhone, and then I'll play it back to hear it. Ahava Leibtag: I'm helping my daughter learn how to write. She's in 10th grade. One of the first things I say to her, "Have you read it out loud first?" Because if you read it out loud, you will just see how you totally misused commas, which everybody I know does all the time. Then she started arguing with me about the Oxford comma too, so that was a moment of pride. But she's for, I'm against. But anyway ... Anna Hrach: I am too. Ahava Leibtag: Yeah, I don't get it. Anna Hrach: No. Ahava Leibtag: But anyway, so to me that's what reading out loud is about. I think it's also about just getting yourself into this idea that writing doesn't have to look like sitting down for an hour and writing. Writing can be quick, fast, in your day, done, and then there's always tomorrow. Anna Hrach: I love it. Okay, so we are going to take a super quick break to hear from our sponsors. But Ahava, I'm excited to get so nerdy with content with you because I love it, and it's a topic I know we both love. Everybody stick around. We're gonna hear from our sponsors, and then we are gonna come back and talk to Ahava some more. Anna Hrach: Hey, everybody. Welcome back to the Content Experience Show Podcast. We are here with Ahava, and she has already dropped so much amazing content gold on us. I'm excited to, Ahava as I mentioned before the break, get super nerdy with content with you, because we are both writers, we both love content, we both love writing in general. Anna Hrach: One of the things that I love that you talked about before the break is just about comprehension, and just how much content, it really affects our customer's experience with us, in general. It is way more critical than we give it credit for. I feel like a lot of times the emphasis is on design, and in the user experience, when I would argue it actually is the content, and I think you would too. Ahava Leibtag: Yeah, absolutely. I was just at a writing workshop on Tuesday, and I waited 'til the end of the workshop to talk about the problems that they were having with their information architecture. They were using a right-hand side menu, but they were putting critical information at the bottom of the body copy, in this box. I said to them, "Can you just walk me through what you were thinking?" As it became clear that they had never really made a content governance decision about what that right-hand menu was gonna be, and they all started to talk about how frustrated were about it. That wasn't such a great way to end out. Ahava Leibtag: But what became clear to me is that nobody sat down and thought about how the content pathway for the user was gonna go. It seemed to me that they were depending more on search than they were on navigation. Search can be the doorway into the website, but once somebody is on the page, they're gonna want to explore more. You want them to explore more. You want the site to be sticky and for the content to be sticky. Ahava Leibtag: It's very concerning to me when I see that going down because it really just makes me realize how much we fought to be in the room when design happens, and how little that really happens. Or if it does happen and they say, "There was a content strategist in the room," I have a feeling that that person didn't really understand the business objectives. Ahava Leibtag: You and I have talked about this before, if you don't know how the company makes money, I don't care if they're a not for-profit, they still need revenue. You're not gonna be able to do a great job as a content strategist. That, I think, is something for me that is very frustrating. Ahava Leibtag: The other thing I want to say about search starting is that we really, as a discipline, need to move away from this idea of search as SEO. This is that whole content strategy, content marketing skit. Because content marketers really care about SEO, and content strategists are like poopoo it. It's keywords and key phrases, and you'll do that in the writing stage. But the bottom line is that search has to happen at the beginning. Ahava Leibtag: One of the things I want to say about writing is, writing is the last part of the process. It has to start in business goals, it has to then go into ideation, it then has to be tested with the audience. Is this really what they need to know about? Then it has to move into a technical phase of how are we gonna write it so that it's appropriate search? That's not just keywords and phrases. There's a whole backend that goes on there. Ahava Leibtag: I got into this argument on Twitter about FAQ pages. All the search marketing experts are saying, "Hey, you need to create FAQ pages now because that's what voice-activated search, that's where the search engines are pulling answers from." There doesn't seem to be this flexibility in our field to say, "Okay, we have to serve the user, and the user is using voice-activated search. You know what, we don't love FAQ pages because we want to believe that we structure our content perfectly." You know what, when you have 25,000 pages, you did not structure your content properly. There's just no way. Ahava Leibtag: That's, to me, the other part of where I think content marketers and content strategists just have to get comfortable around this idea of this is the way the customer has developed coping strategies. It doesn't matter what we want them to do. It's like kindergartners. You want them to sit down in a circle, but they're not there yet. They don't have the cognition. Anna Hrach: Okay, they just want to run. Ahava Leibtag: Yeah, they want to run around, or they want to sit next to a good friend. It's the same thing. The audience needs to do what the audience needs to do. They don't need to do what the content strategists tell them to do. That frustrates me also. It's like that going back to that writing workshop, we wanted to put that IA there because we thought that that would make sense for what we were trying to accomplish. It's like, "Mm, it's not." Or if you're gonna do it there, then figure out what you're gonna do with that box at the bottom. Anna Hrach: Right. No, it is really fascinating. No, and I agree with you on search in general. You're right, it is fascinating how on one side, it's all about SEO and making sure everything is optimized to a T. Then the other side it's a last minute thought, just put it in at the end. As long as we have the content there that users want, they'll find it. I agree that it's a middle ground. Anna Hrach: The other thing that I love too about search, just from the experience side is looking at vernacular, and looking at what people are actually looking for, versus how we're labeling things, verus how we're calling things. Because that at the same time as optimization and user experience content creation. Even just looking at ... Especially with you working with so many hospitals and so many different insurance companies, they have one set of vernacular. The user calls it something totally different. Ahava Leibtag: Yeah. Talk about nerding out about content. Steph Hay has a great thing she uses, calls a language board, which we've incorporated into our practice at Aha Media Group because we interview so many subject matter experts who have their own vocabulary around their area of technical expertise. What we do is we do keyword research, and then we come in and we say, "This is what your audience is calling it, what are you calling it?" We show them the volume. Ahava Leibtag: There's a very common example in healthcare which is hypertension versus high blood pressure. Everyone searches for high blood pressure. But the doctors are like, "No, it's hypertension. You have to put that into the content." We'll say things like, "High blood pressure, also known as hypertension." But what's really significant about doing that language board is that later when the stakeholders go back into factually edit the content, they've been prepared that the audience's vernacular is gonna be used, not their vernacular. It helps shape their thinking around what we're really trying to accomplish. Ahava Leibtag: I think those kind of tools, again going back to the idea that search is the beginning of the user experience, everybody involved in the content needs to be comfortable with that idea. Not just the people writing the content, not just the people ideating about the content, not just the people who are setting up the backend of the content, but also the stakeholders who are involved in the creation of the content. Ahava Leibtag: That's where I feel like we have a lot of work to do in educating people about what we're really trying to accomplish when we create a piece of content, and what we're trying not to accomplish, because if we are condescending to our audiences, or we use big jargoning words, they're jumping off that page like you can't imagine. But if we're speaking to them in a way that feels comfortable to them, they're gonna begin to develop that trust with us. That's where content strategy and content marketing really intersect. Anna Hrach: Good point. For any writers out there who are listening and are really having trouble getting their team, their organizations on board with plain language, and writing for the users, and really jumping away from just purely business focused content, what tips or advice do you have for them, and how to just get buy-in internally? 'Cause that's a huge part of content creation, is just getting that team on board. Ahava Leibtag: Oh gosh. Anna Hrach: It is a process though. It is a process. Ahava Leibtag: Oh gosh. Next question. No, so let's start with the plain language questions, 'cause I think that that's a really good one to start with in terms of that's part of their downstream. But one of the things that we try to do is get the person into an empathetic frame of mind for how they're actually talking to the person. Ahava Leibtag: What would you say if the person was in your office? What would you say if you could actually speak to the person face-to-face. Those help set the tone for what the content should sound like. I think convincing people about those things is really important in terms of getting them to use plain language. Statistics really help. There is proof that plain language will bring down hospital admissions by 12.5%. With the ACA, hospitals are clamoring for that. When you put that in front of a doctor, they're gonna have a hard time arguing with that stat. Ahava Leibtag: Then the first thing you said is about getting everybody on the same page. It's definitely a really big process. I think I have worked with enough organizations where when they say to me, "We just want to put content up on the wall and see what sticks," I know it's gonna be a disaster of a project, because they don't have a specific strategy in place, and they're not really clear about what they're doing. To me, that's really challenging because it means that you're gonna have a hard time as a writer and a content ideator with them, to figure out how to get the most out of them that you can. That, to me, is really frustrating, and that's where you have to go back to the business objectives, what are we trying to accomplish? What are we really trying to do? Anna Hrach: Nice. I love that advice. I think that is solid gold, 'cause it is. A lot of times a huge part of just the writing process is just getting everybody on the same page, and getting everybody as a team to really create that effect of content that's going to reach users and achieve our business goals. I love it. Anna Hrach: Ahava, thank you so much for joining me today. This was so much fun. I'm glad we got to nerd out, even for just 30 minutes on content, because I so rarely get to do that anymore. I love it so much, and you gave so much amazing information. Thank you so much for being here. Ahava Leibtag: You're so welcome. I don't really feel like we nerded out so much. Anna Hrach: No. You know what, 30 minutes isn't a really great time. I feel like we definitely could have gone into that Oxford comma and really just pissed everybody off, and then also the right-hand side bars. That probably is pretty controversial subject as well. We could have touched on a lot more nerves here, but we didn't. Anna Hrach: Because you have so many ... Real quick, before we jump into some really fun getting to know you questions, where can everybody go download all these amazing tools and resources that we talked about today? Ahava Leibtag: Sure. Ahamediagroup.com. A-H-A-M-E-D-I-A group.com is where you'll find everything. If you search Ahava Leibtag, I am all over the internet. You'll find me on Twitter @ahaval, Instagram @ahaval, I'm on LinkedIn. I have a great Writing Wednesdays series that everybody loves. Somebody asked me ... You know I just finished Jay Baer's Talk Triggers. I was thinking about what's my talk trigger, and I was talking to somebody about it. I'm like, "My red glasses and my red lipstick." Anna Hrach: That's amazing. See, look at that. That's awesome. But yeah, Writing Wednesdays are amazing. Ahava Leibtag: Thank you. That's on Instagram and LinkedIn every Wednesday. If you have questions for me, email me hello@ahamediagroup.com is actually monitored by me, because if you have questions, I will try to answer them. If I don't know, I will send you an email and say, "I don't know. I'm gonna figure that out for you," and then I'll cover it on a Writing Wednesday. Ahava Leibtag: It's amazing to me, I say this to people all the time and very few people take me up on it, but when they take me up on it, they're like, "I cannot believe you answered me so quickly." But hey, that's what I'm here for. I want to learn just as much as everybody else. I always say, when people ask me, "When we're looking for a content strategist, what should we hire? What are the most important traits?" I always say, "There's one thing that matters more than anything else, and that's curiosity." If somebody isn't curious, they're not gonna be good at this job. I'm curious too about what you're thinking, and where you're running into trouble. I have an opinion. It might not be right, but I'm certainly happy to share it. Anna Hrach: Nice. All right, well with that everybody, go follow Ahava, go email her, go download all that great stuff. We are going to get to know her on the personal side a little bit here in just a quick second. Anna Hrach: All right, everybody. We are back with Ahava. We are gonna to get to know her a little bit more on the personal side now that we've known all about her on a professional side. Ahava, I have two questions for you today. One of them, you mentioned at the top of our call that you were a voracious reader as a kid. I know that you still read a ton today. One of the things I'm curious about, because whenever I ask everybody what their favorite book is, they have this amazing answer like, "I love to read Shakespeare," and they come up with these amazing novels and classics. What is your favorite guilty pleasure read? Whether it's a romance novel on the beach on vacation, or the latest teen drama. What's your favorite guilty pleasure book? Ahava Leibtag: I actually don't really believe in guilty pleasure books. I think any book you read, and you get fun out of, is fantastic. I don't care what level it's written on. Anna Hrach: I love that. Ahava Leibtag: I will say though that when I was a kid, I read all the Sidney Sheldon novels, like the original Sidney Sheldon, and I loved them. I want to actually go back and read them because they were so good, so ridiculously fun, and great. I think about them often 'cause I read them so much as a kid that there are certain phrases that I really remember. He was a great storyteller. He just knew how to bring something to life. He wrote about con men, and jewelry heists, and it was just so fun. Ahava Leibtag: My favorite book is Station Eleven, which is a post-apocalyptic novel. I'm very into those now, which tells you something about the state of the world. I like all those kind of books. I think it's really fascinating to think about, if the world was gonna end, what would it look like? That's it, and I'm a big fan of Harry Potter, and all that stuff. There are books. There's a great questionnaire, I forget who runs it, which what books do you feel guilty about not reading. I think it's Entertainment Weekly. I've never read Little Women. Anna Hrach: I haven't either. Ahava Leibtag: Isn't it horrible? Anna Hrach: Do I have to give back my feminist card? I feel like that's a must-read for everyone. Ahava Leibtag: I know. You know what, let's promise each other, by the end of the year we'll read it. Anna Hrach: Sure, yeah. I do want to. I know it's a good book. Ahava Leibtag: I know. We'll just let you know what happened, so that's the bummer. There are other books that I just ... I've never read all of Shakespeare. I've never even read the whole bible, which is funny, 'cause I'm Jewish and pretty [inaudible 00:28:13]. There's many things I haven't read. Anna Hrach: There's a lot of books that I feel like everybody feels pressured to read, but that's why I love your response of any book that you get enjoyment out of is a book that's worth reading. I love that because nobody should be shamed for enjoying what they read. It's awesome. Ahava Leibtag: Totally. Anna Hrach: Agreed. Second question, actually our last question. There's a lot of great TV out right now, especially a lot of new releases coming into ... Especially we just came off of the spooky season of October. What are you binge watching right now? What is a show that you would recommend hands down to anybody to watch? Ahava Leibtag: I binge watch according to what my children want to watch with me. Right now I'm going through the Marvel movies with my son, Navon. He's 10. He talks constantly throughout the movie. I have no idea what's going 'cause all he wants to do is share all the extraneous material that he knows. That's hilarious. Ahava Leibtag: Then I'm watching The Great British Baking Show with Amaya, my 13 year old. Anna Hrach: I love it. Ahava Leibtag: I love it. I'm actually about to publish an article called What You Can Learn About Content From The Great British Baking Show, so look out for that. Anna Hrach: It's so good. Ahava Leibtag: Then with my oldest daughter, we love scary ... She introduced me to scary movies. She loves scary movies, and I hate them, or I thought I hated them. I never watched them. I stopped being afraid of the dark when I was 42, so it's worked out well. She and I are now binging The Haunting of Hill House, which is ... Anna Hrach: It's so good. Ahava Leibtag: We are totally freaked out by it. We just watched the second episode last night, the one where the aunt crawls out of the ... Anna Hrach: It is, yeah, so spooky. Ahava Leibtag: It's so spooky, but we're really enjoying it. Then my husband and I are supposed to be binge watching Fauda, which is the Israeli series on going in and killing people, but I don't know, we just fall asleep at night 'cause we're so tired. Anna Hrach: Probably 'cause you've already watched so much action packed things up until that point that your body is like, "No more." Ahava Leibtag: Right, exactly. Anna Hrach: [inaudible 00:30:11] a lot of very intense episodes. Ahava Leibtag: Yes. I think that ... We watched the first three and think that might be why we just gave up. But no, there is some really great TV out there. I just finished watching Breaking Bad. I had never watched Breaking Bad. There's some incredible storytelling out there right now, and I think it's really great that we're getting to see all these different stories from all these different angles. Ahava Leibtag: That's why I would say, no book is bad to read because the whole point of art is to give us a window into a world we don't know. Even books that seem ridiculous, if they speak to you then they're valuable. Anna Hrach: Nice. I love it. Ahava, thank you so much. You gave us so much amazing information on this, so much wisdom, so much advice and guidance. I love it. Thank you so much for being here. Ahava Leibtag: Thank you so much for having me. Anna Hrach: All right, everybody. Like Ahava said, please go ahead and follow her on all of the social channels. Visit ahamedia.com and download all those amazing materials. Also email her. She's there and ready to answer any question that you might have. Anna Hrach: Thank you, Ahava, again for being here. On behalf of Randy Frisch, we really loved having you hear. Everybody else, please go ahead, wherever you subscribe to this show, leave us some feedback and leave us some comments. We'd love hear about what other topics you'd like us to cover. Until next time, this has been Anna Hrach with the Content Experience Show Podcast.